Aldehyde dehydrogenases (ALDHs) belong to a superfamily of NAD(P)+-dependent enzymes, which catalyze the oxidation of endogenous and exogenous aldehydes to their corresponding acids. Increased expression and/or activity of ALDHs, particularly ALDH1A1, have been reported to occur in human cancers. It is proposed that the metabolic function of ALDH1A1 confers the “stemness” properties to normal and cancer stem cells. Nevertheless, the identity of ALDH isozymes that contribute to the enhanced ALDH activity in specific types of human cancers remains to be elucidated. ALDH1B1 is a mitochondrial ALDH that metabolizes a wide range of aldehyde substrates including acetaldehyde and products of lipid peroxidation (LPO). In this study, we immunohistochemically examined the expression profile of ALDH1A1 and ALDH1B1 in human adenocarcinomas of colon (N = 40), lung (N = 30), breast (N = 33) and ovary (N = 33) using an NIH tissue array. The immunohistochemical expression of ALDH1A1 or ALDH1B1 in tumor tissues was scored by their intensity (scale = 1-3) and extensiveness (% of total cancer cells). Herein we report a 5.6-fold higher expression score for ALDH1B1 in cancerous tissues than that for ALDH1A1. Remarkably, 39 out of 40 colonic cancer specimens were positive for ALDH1B1 with a staining intensity of 2.8 ± 0.5. Our study demonstrates that ALDH1B1 is more profoundly expressed in the adenocarcinomas examined in this study relative to ALDH1A1 and that ALDH1B1 is dramatically upregulated in human colonic adenocarcinoma, making it a potential biomarker for human colon cancer. â–º ALDH1B1 and ALDH1A1 are differentially expressed in normal human tissues. â–º ALDH1B1 is expressed at higher levels than ALDH1A1 in human epithelial cancers. 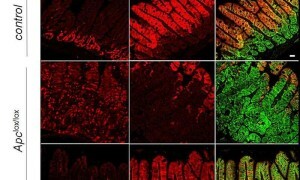 â–º In normal human colon ALDH1B1 is expressed strictly in the stem cell compartments. â–º In human colonic adenocarcinoma ALDH1B1 is intensively expressed in all cancer cells. Corresponding author. Address: Department of Pharmaceutical Sciences, University of Colorado Denver, 12700 E. 19th Avenue, Aurora, CO 80045, USA. Fax: +1 303 724 2666.